84. 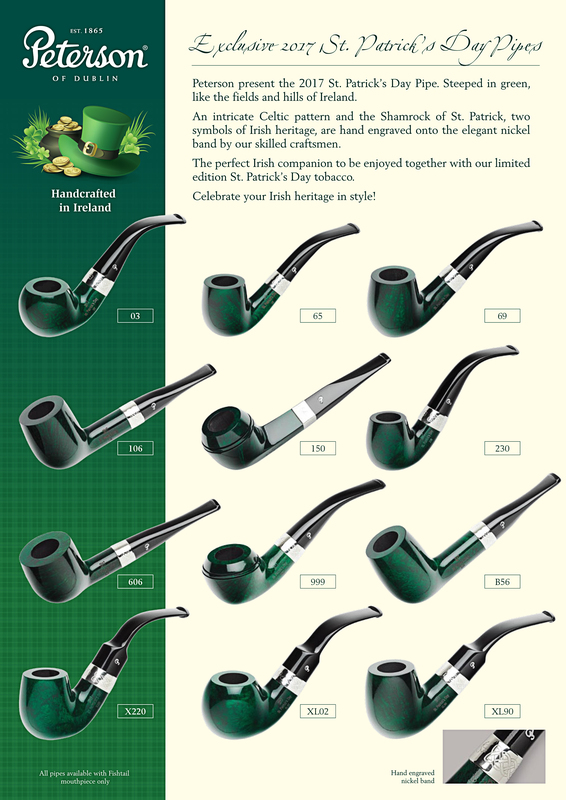 A Visual History of the St. Patrick’s Day Pipes, 1998–2018. Lá fhéile Pádraig sona dhuit! 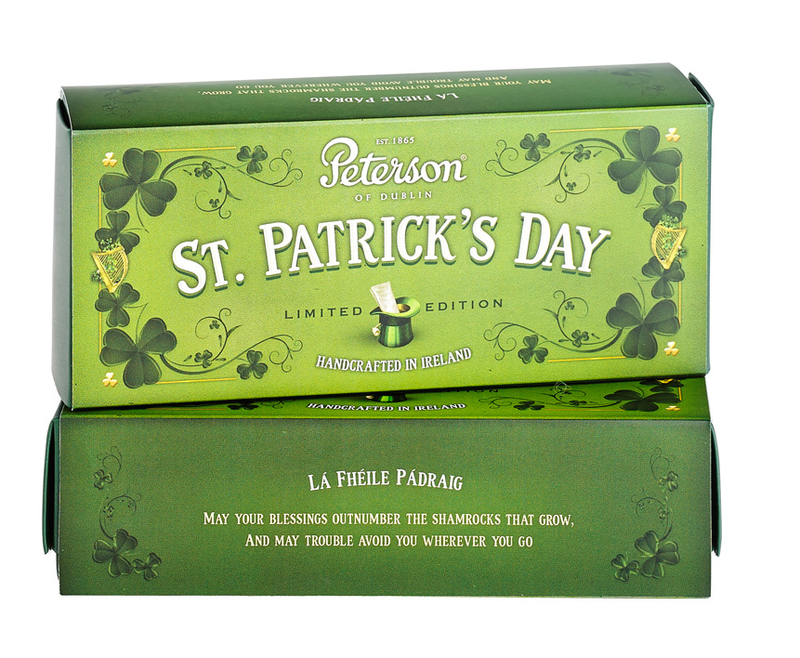 Happy St. Patrick’s Day to you! 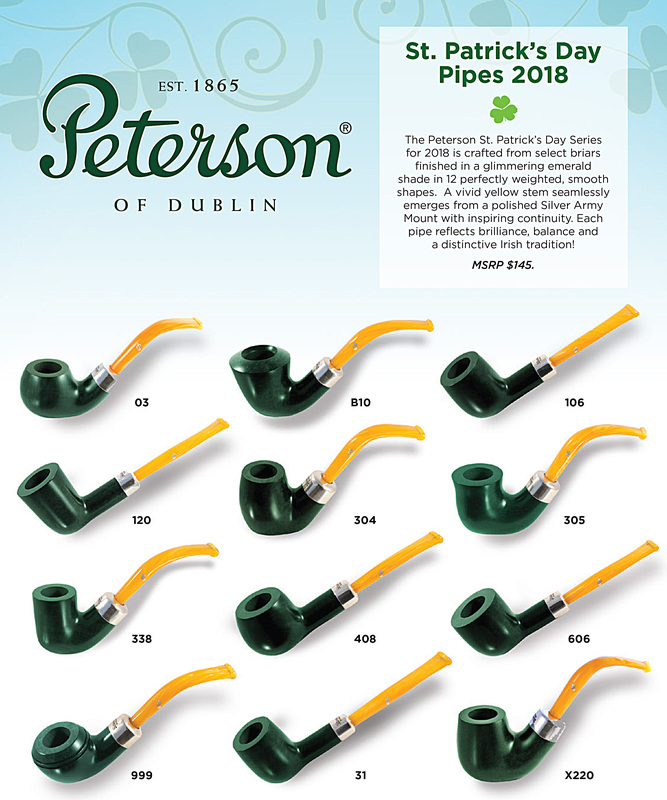 This marks the 20th anniversary of the St. Patrick’s Day commemorative pipes for Peterson, and I couldn’t think of a better way to celebrate than by offering a visual history of the series. 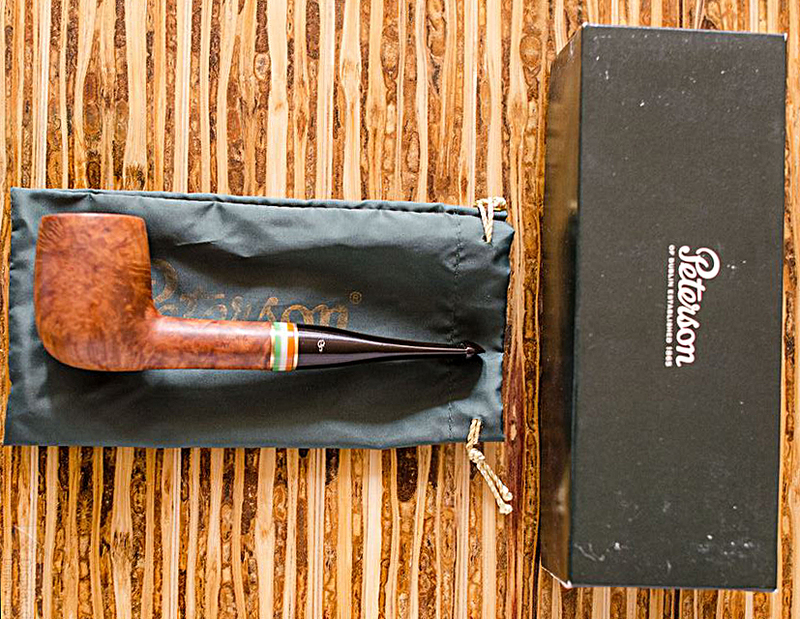 Tom Palmer’s idea for an annual pipe took flight in 1997, when Peterson released its first Limited Edition / Pipe of the Year. 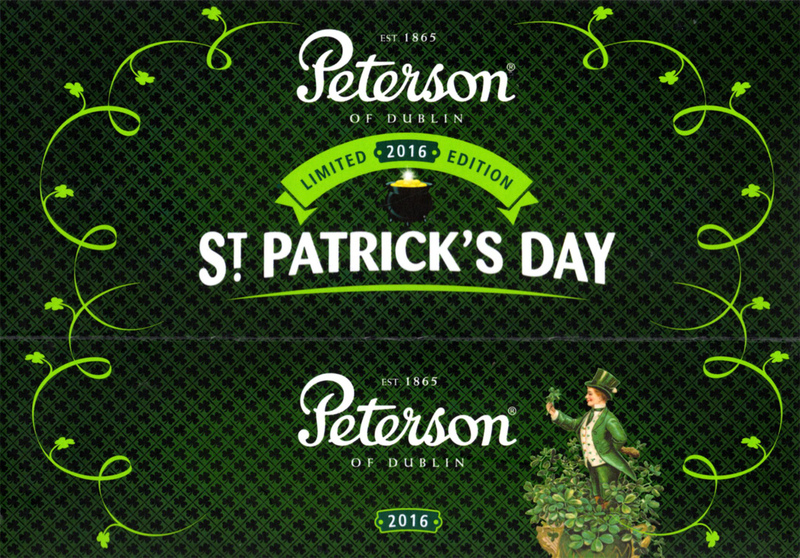 The following year the company decided to add two annual commemoratives, a St. Patrick’s Day and a 4th of July. 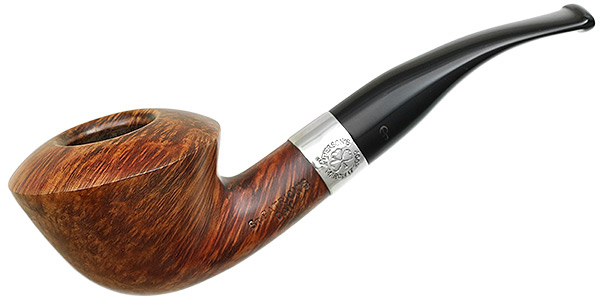 While the 4th of July pipe has long been gone, the SPD has given Kappnists (or Pete Nuts) many great pipes over the years, with none perhaps quite as marvelous as this year’s 20th anniversary 2018 and the original 1998. The price-point of the series is at the solid entry-grade of the Classic Range, roughly equivalent to the Aran line in most years (with some exceptions). 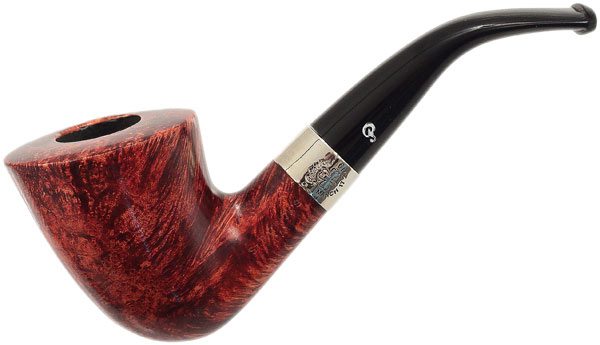 Another distinguishing feature of the series is that in many years a shape (or even two or three) from a special collection or high-grade series—think the Antique Collection for the former and the Sherlock Holmes for the latter—is often featured. 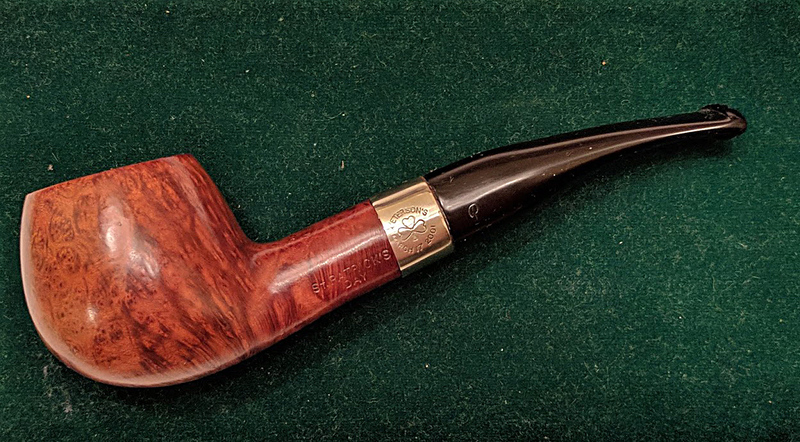 Every Peterson high-grade issue has bowls that aren’t of sufficient quality to make the cut but must be used, and often these feature some fantastic grain. For most of the more recent years, the series has offered 12 shapes. 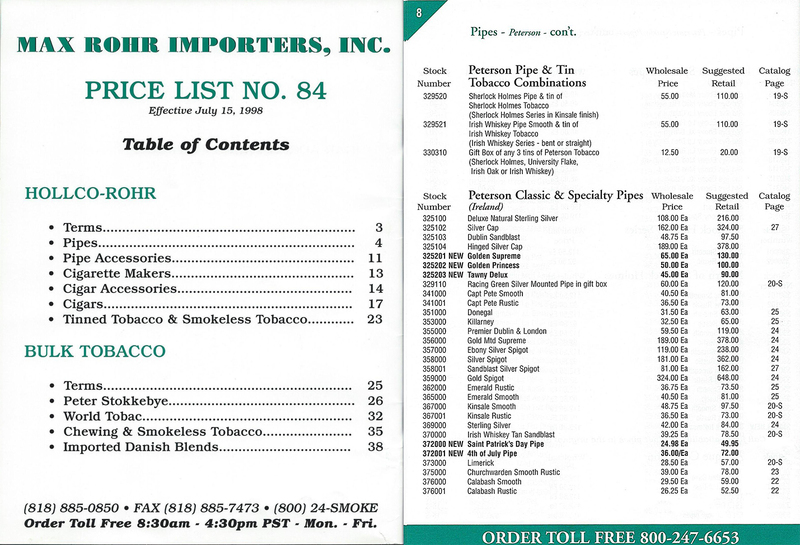 We know the series began in 1998 because Brad Weinfeld of SAG Imports was working for Hollco-Rohr, Peterson’s US distributor at the time, and during the course of our research on the Peterson book he took the trouble to send us the final sales catalog of that company, dated July 15, 1998. If you click on the image, you can see the SPD and 4th of July annual commemoratives described as “NEW,” as well as their wholesale and retail prices. 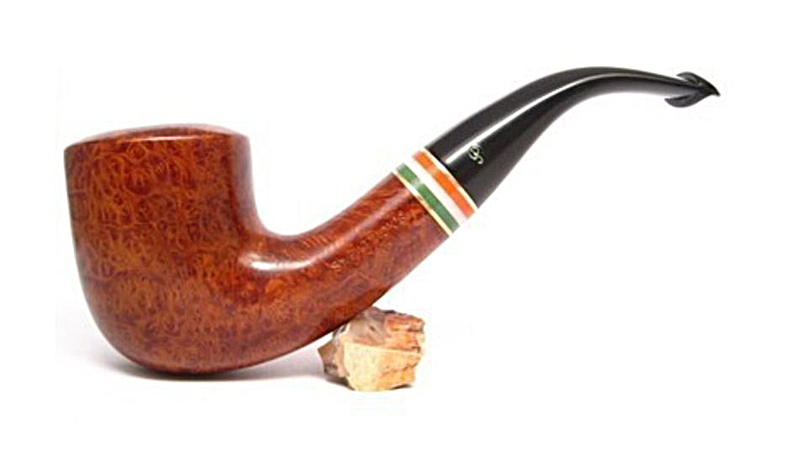 The series began auspiciously enough, with a brass and acrylic sandwich band of the Irish colors and P-Lip. For this and most of the years, I don’t know which shapes were released, although they were for the most part taken from Classic Range shapes. 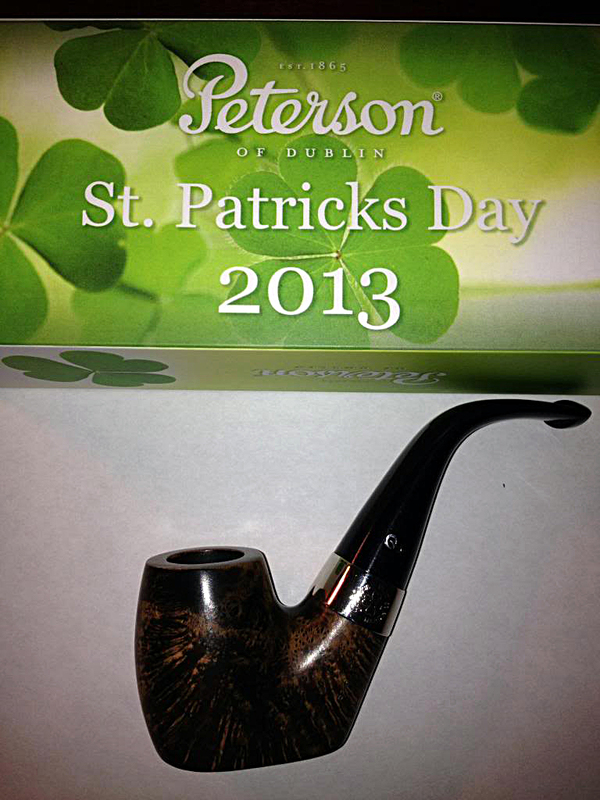 Two of the three images of purported 1998 SPDs I have show a light, matt finish. Seen above is the unique bent shape from the 1997 Racing Green / Claret limited editions. I can’t give you the shape number, because there wasn’t one stamped on the only Racing Green I have handled. As you can see from the two representatives, the 1998 SPD was released with a P-Lip. The mouthpieces featured the white impressed P standard at the time. Dustin Anderson and I both have XL20 SPDs (seen above) with a dark gloss finish and the tricolor acrylic and brass band. We both have assumed (at least until now) that these were first-issue SPDs for 1998. However, I have been able to find no trace of a documented SPD for 1999, nor indeed any pictures at all for this year. I’ve asked Peterson and searched all the usual places but come up empty-handed. I have two hypotheses: perhaps the dark-stain XL20 Dustin and I companion are actually a 1999, rather than 1998 issue. This would explain the disparity of stain between this pipe and the two examples of the 1998 seen above, and also accommodate my theory that most years of the SPD feature a single trickle-down special shape. 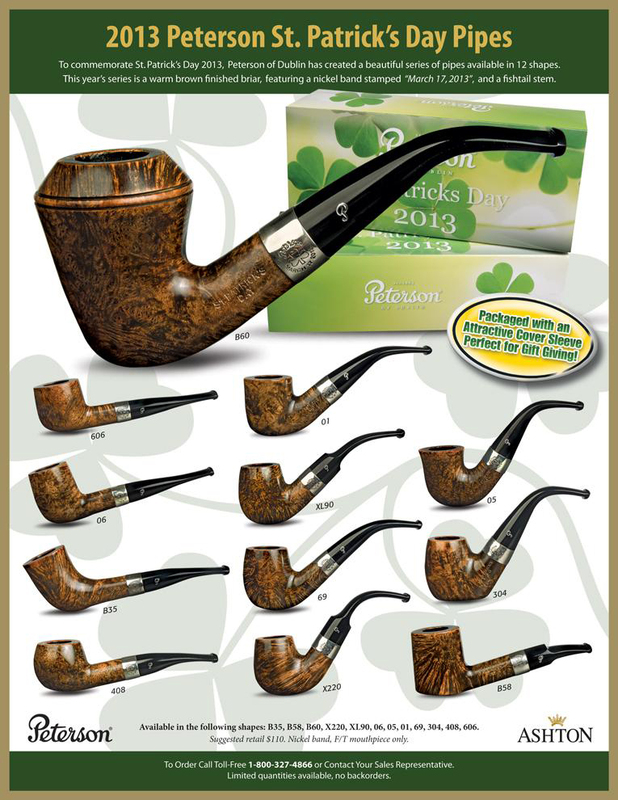 Why would the dark XL20 and the light Racing Green special shapes be released the same year? What counters this idea is the long-standing belief circulated by Pete Nuts that only the 1998 featured the acrylic tricolor band. A second possibility is that there simply was no SPD for 1999, but that also seems rather unlikely given the series otherwise uninterrupted history. 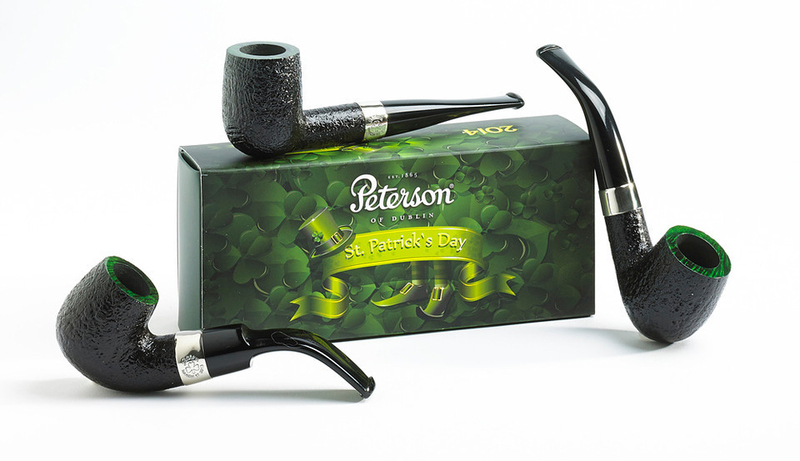 In 2000, the SPD series settled into its most familiar guise: some variant of brown-hued smooth bowl and a nickel band with Peterson’s over a shamrock over March 17 and the year. 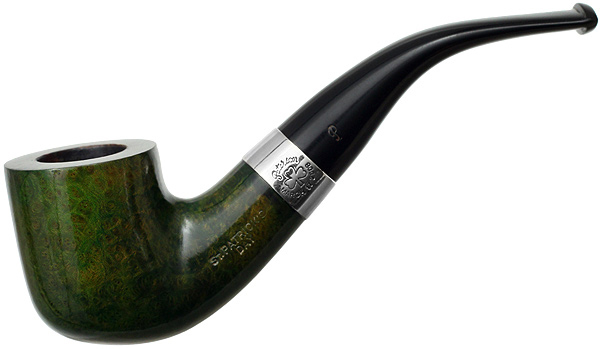 The 2000 SPDs also featured the beloved P-Lip vulcanite mouthpiece. 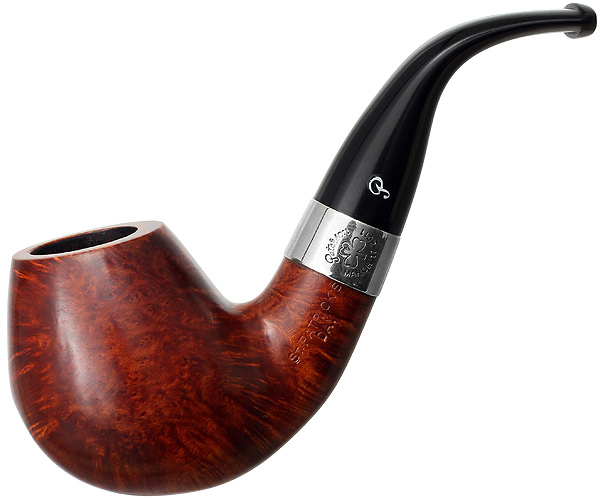 Shown here is what must have been the collector’s piece, the A3 shape from the first Antique Reproduction series. In 2001, the SPD lost its P-Lip, never to return. 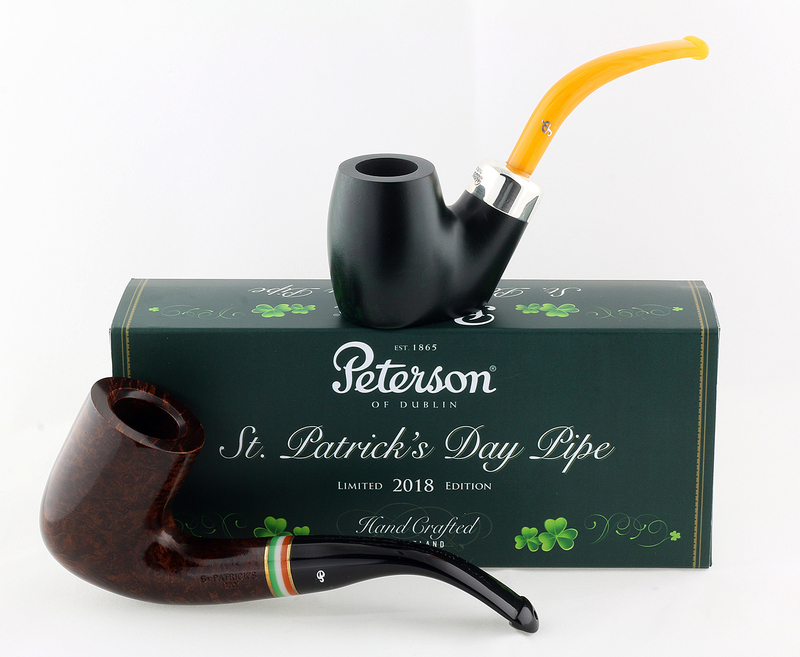 Peterson seems to have changed directions at about this time, giving in to market pressure on the one hand and (perhaps) a lack of interest in promoting the P-Lip on the other. I say this based on my own hunches from research during the course of the book, and while a company must remain viable to survive in the marketplace, from a historical point of view at least, it was unfortunate. 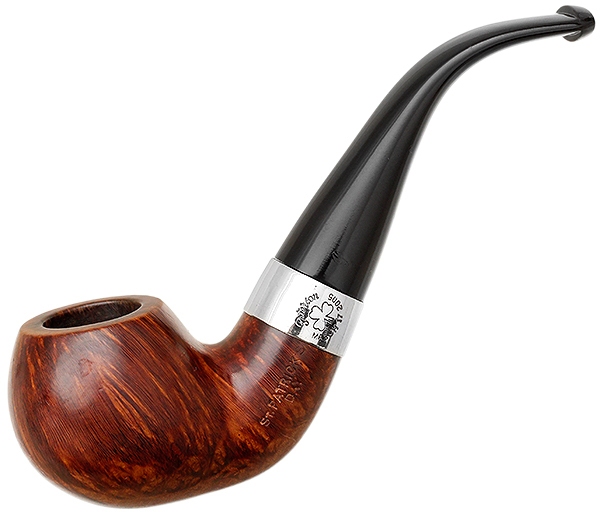 The collector’s piece for 2001 (again I hypothesize based on the assumption that there would be only one special shape for the year) was again the Return of Sherlock Holmes Rathbone. I would guess that the fabulous B7, pictured here, was 2002’s collector’s shape. 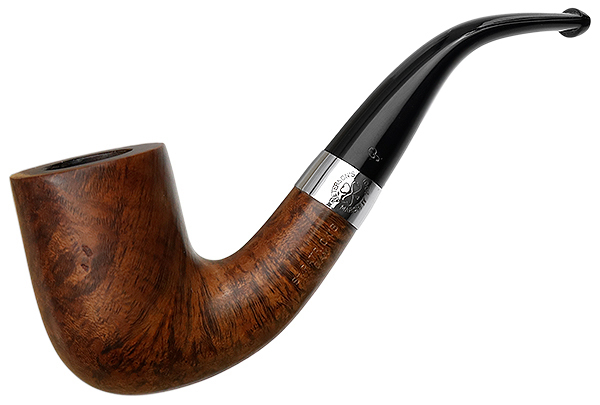 An unusual entry for the series from the Classic Range, the 68 brandy—this is a real handful of a pipe, absolutely magnificent to hold. More on the shape soon! 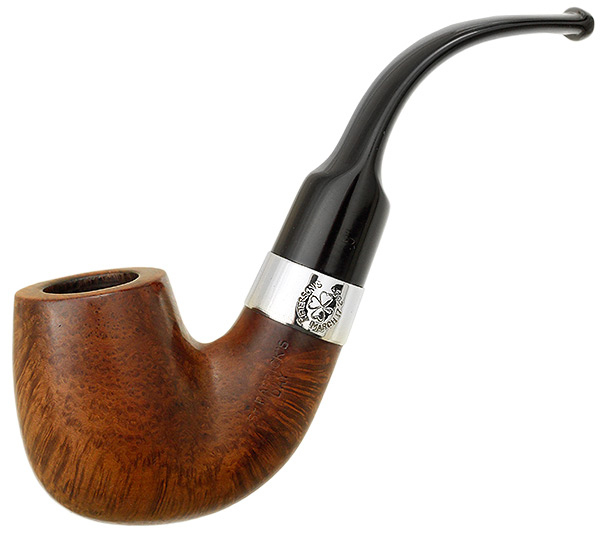 The classy, English-style 80s bent bulldog: perfect for your favorite Latakia bomb! The B10 appeared around 2002–2003 and may have been the collector’s piece for 2007. 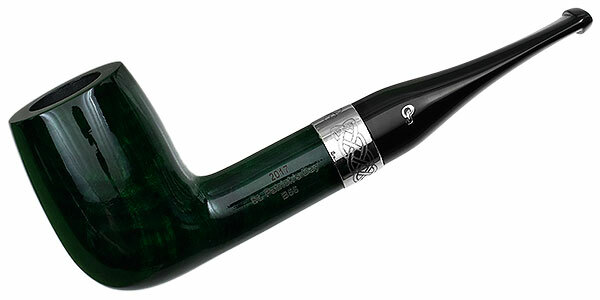 2008 was the first year of Peterson’s green SPD releases. I’ve included two illustrations to give you some idea of what you can expect. Craftsmen at the factory have told me they had a hell of a time in the beginning figuring out how to do a really good green. Here’s the undoubted collector’s piece from 2009: the oversized 502, from the short-lived 500 shape group. See what I mean about the spectacular grain sometimes found in the SPDs? Simply amazing. Here’s a bulldog, Irish-style! The now deleted B2, for all fans of heavy (in looks, not weight). This might well have been the collector’s shape for 2010. . .
. . . except that there’s also a fabulous B30! Maybe the exception proves the rule? The collector’s piece for 2011: a B40. . .
. . . or was it this D9 from the deleted D (Danish) shapes? The mighty 107 makes another appearance in the SPD series. As you can see from the 2013 electronic strut card, there were actually three special shapes released in the 2013 SPD (the B35, B58 and B60), one of the most remarkable in the series’ 20-year history, not merely in the shape selection, but also in the smoky-matt finish. 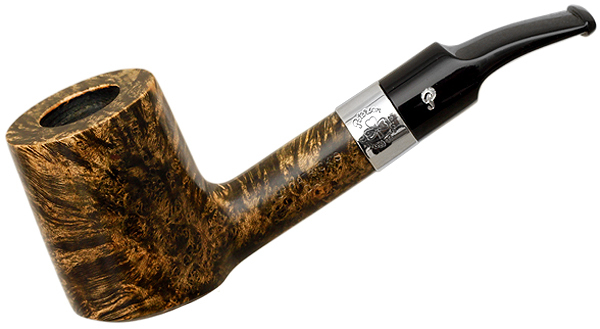 The amazing B58, the “rocking setter” from the Iceberg Collection, was widely admired among Kappnists at the time. I don’t know when Peterson began putting sleeves on the SPD series, but this is the earliest I’ve sourced, from 2013. You can read all about the 2014 SPDs here. The second SPD green release came in 2015. The 2015 box curiously omits the year of release! The D19 (formerly LT or Large Tank) from the Mark Twain Collection was the collector’s shape for 2016. 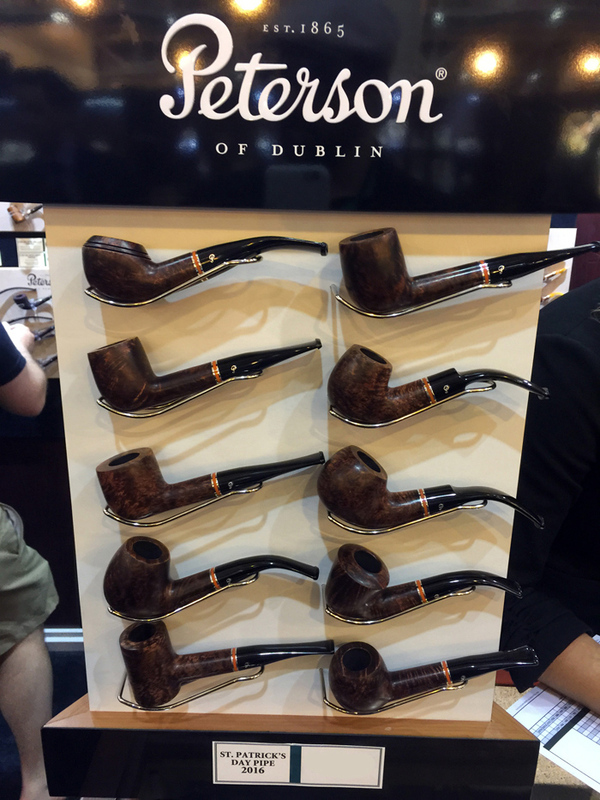 The 2016 SPD on display at the 2015 IPCPR Show. Ten shapes? Surely not. 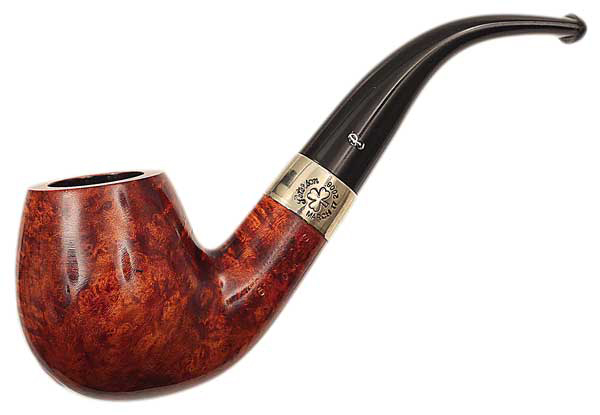 The B56, originally the Adventures of Sherlock Holmes Sylvius, was the prize catch for 2017, signaling (in this case) the impending deletion of the Adventures of SH from the catalog. 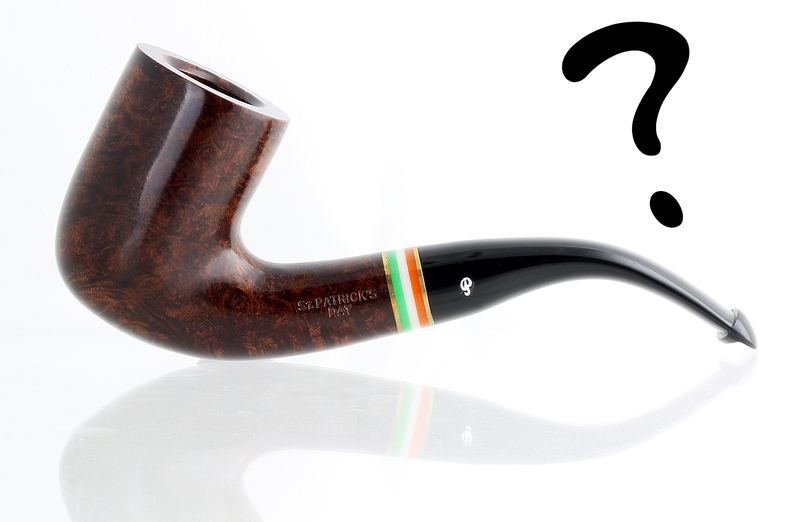 At the IPCPR show last summer, Tom Palmer said the 2018 SPD was intended to represent the Irish flag—the green (bowl), sterling band (white) and orange (mouthpiece). 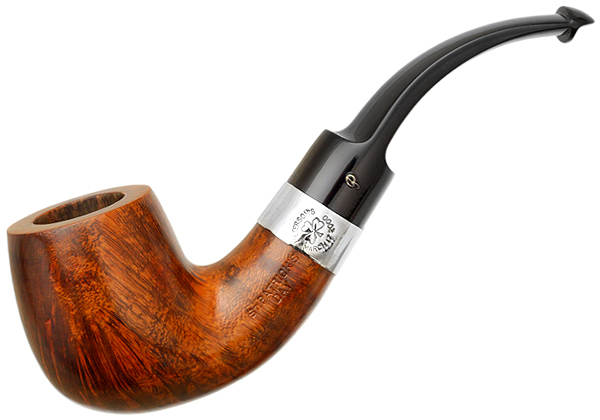 What better way to celebrate the 20th anniversary of the pipe? It’s certainly the highest-end since the first issue. After Saturday I’ll let them rest for another year. You put me to shame, Tom! You’ve almost got a 7-day set there. Thanks for the great history Mark! What stands out as especially interesting to me is the fact that based off of the two pictures of the 2008 edition there are multiple finishes in that years edition released to the public…so yes, it looks like the craftsmen did have a hell of a time finding the right staining technique to acheive the coloring they wanted. 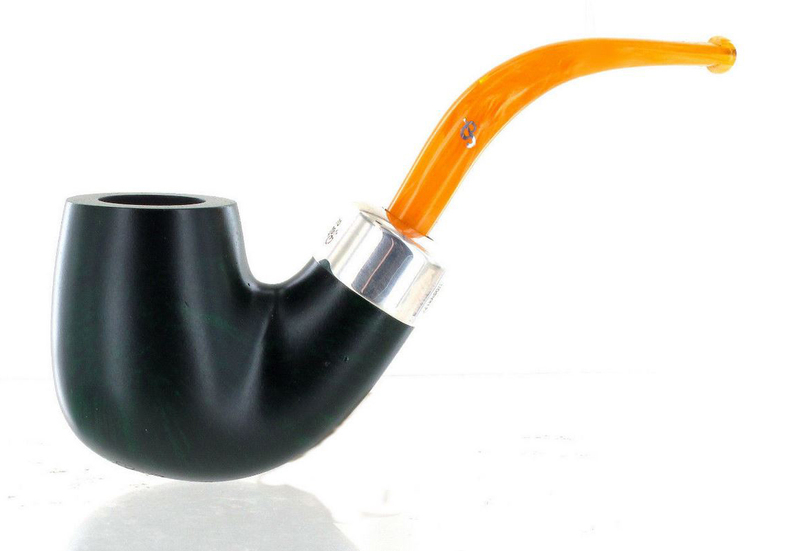 As a pipe maker myself, I can tell you the top 2008 pipe was given one coat of green dye, then finished on the wheels. The bottom was given two coats of green dye. It was buffed with compound after the first, then stained and buffed again. I am willing to bet that there are 3 stain variations of the 2008 edition…one with one coat, one with two, and probably a few that were contrast stained with black and green. Most will be the two coats of green as that is the best use of time and supplies, however it looks like you found that they put at least 2 to market with probably a few black/green ones floating around. It would be great to see if others had pictures of the 2008 edition when they were new and not weathered by use, as green is one of those stain colors that is very, very hard to stand the test of time. Hi Doc! Very informative. I agree, it would be worth while to look out a few more examples of the 2008. 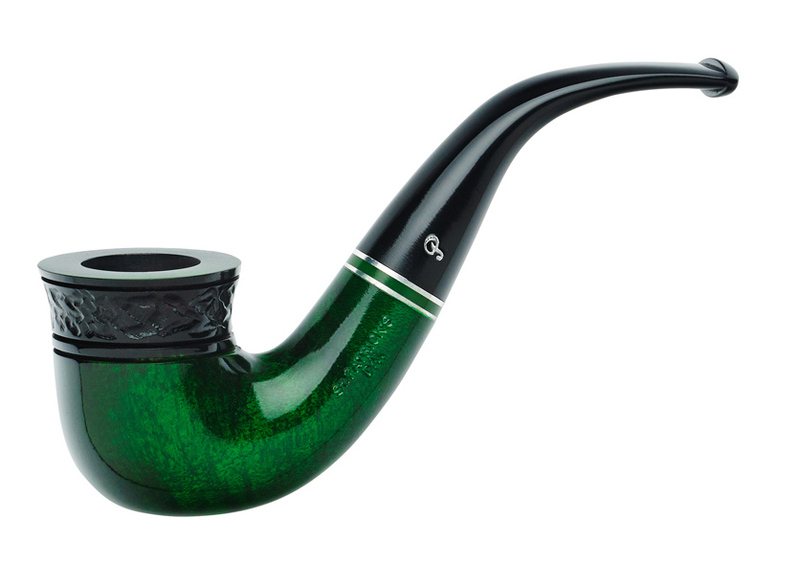 I acquired my first green Pete with this year’s 304, and am still leary about how to keep it looking nice, as I do sometimes overpack the pipe, resulting in a darkened back rim. Never a problem with brown stains, but green?? 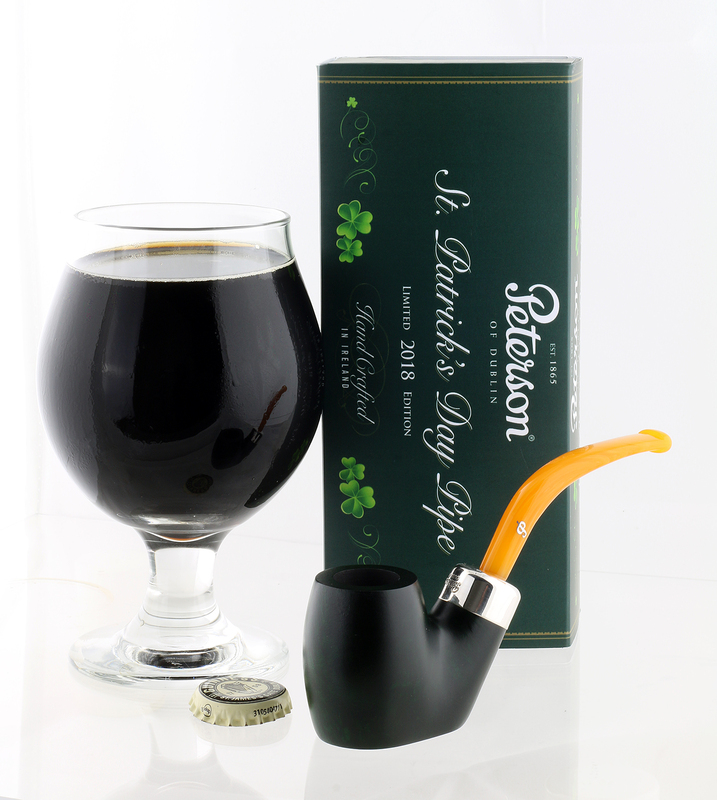 A beautiful summary, I shared this on the PipesMagazine.com forum. Thanks for spreading the gospel, Al! 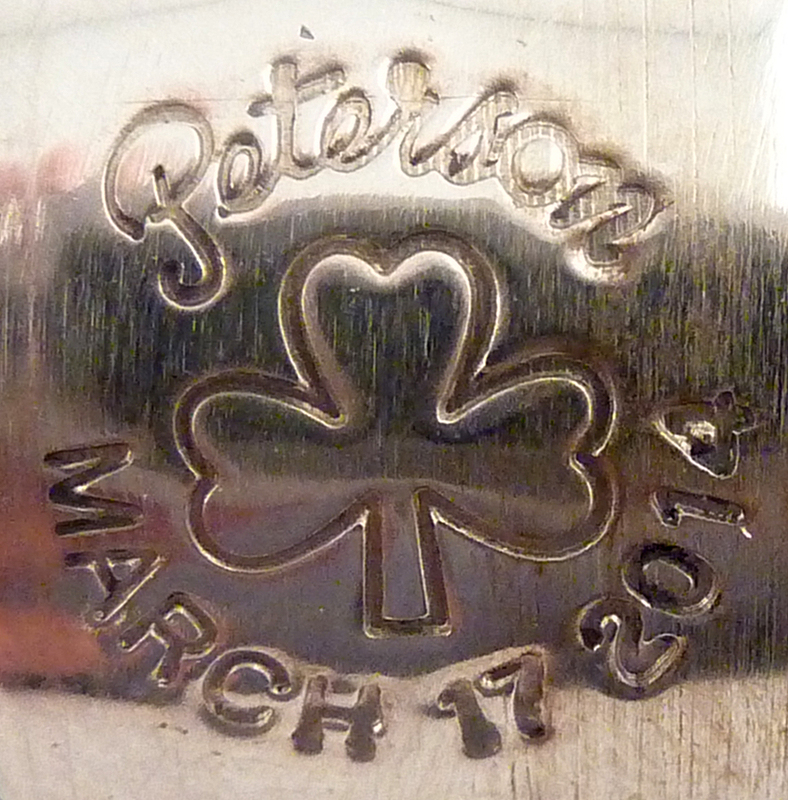 Hope you’ve had a good St. Patrick’s Day.